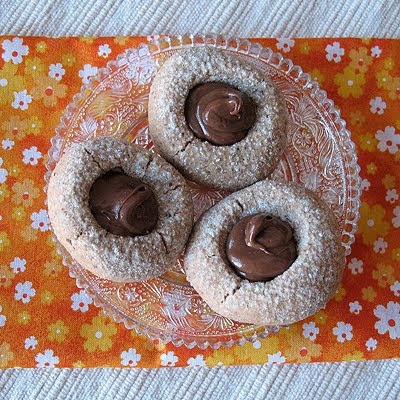 I make thumbprint cookies every Christmas. Yummy little buttery cookies filled with seedless jams and lemon curd, small enough to pop into your mouth with one bite! 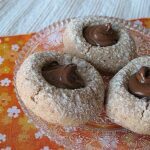 Yum.. After reading through this thumbprint cookie recipe and noticing that ground hazelnuts played a big roll, I immediate thought that Nutella would be an ideal filling. 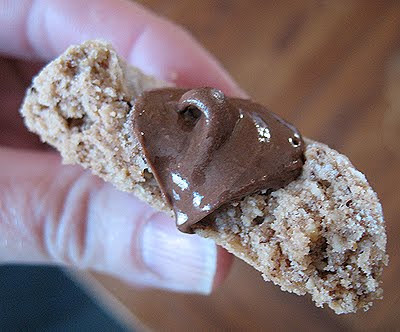 The chocolate (not the Nutella) idea was actually an after thought. I had already rolled one full cookie sheet (by the way, I doubled the size of the cookies, 60 was just too many) when I decided to add a tablespoon of cocoa to the remaining dough. So half of my cookies were as written and the other half were a little chocolatey. 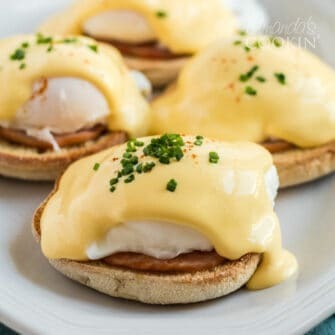 I looked back at my own thumbprint recipe, which always turns out tender and buttery, and found that the only ingredients are flour, butter, sugar, orange juice, and an egg yolk. 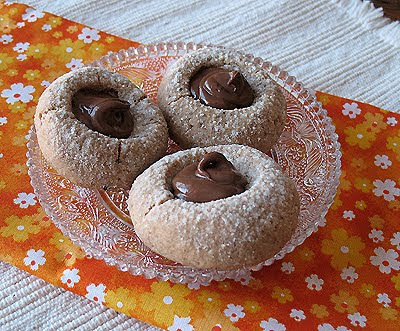 Dorie’s recipe contains flour and ground hazelnuts for the dry ingredients, and sugar, butter and extracts for the wet. There’s no egg yolk or any other liquid. That leads me to believe that she used the moisture from the ground nuts to contribute to the moisture. Another difference between mine and Dorie’s is that hers bake all the way before filling them. Mine you bake 10 minutes, fill them, then bake 5 minutes more. Dorie boils the jam and fills the cookies after they are baked. 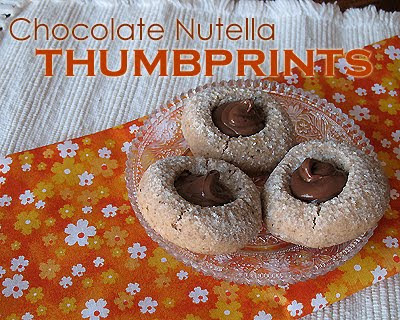 These were fun, they were easy to make, but I still like my thumbprint recipe better. Special thanks go out to Mike from Ugly Food for an Ugly Dude (don’t you just LOVE that blog title?? Hee hee!) for hosting this week’s Tuesday With Dorie pick! You can get the recipe below, or turn to page 164 of Baking From My Home to Yours by the fabulous Dorie Greenspan. Whisk together ground nuts, flour and cocoa. In a mixer beat butter and sugar on medium speed until light and fluffy. Add extracts and beat to blend. Reduce speed of mixer to low and gradually add flour mixture until a dough forms. Use a cookie scoop or a teaspoon to portion out dough. Roll it gently in your hands and place balls two inches apart on cookie sheets. Use the end of a wooden spoon to create a well in each dough ball. Do not go all the way down to to the cookie sheet. 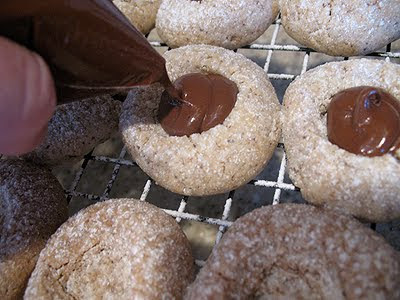 Remove from oven and fill each well with Nutella (to come level with the top of the cookie). Return cookies to oven for 5 minutes more. Remove to wire cooling racks and dust with Confectioners' sugar. Well, they sure *look* good. Sorry they didn't measure up. It's hard to beat a favorite recipe. I'm sorry these weren't a hit with you, but I loved reading your comparisons between your go-to recipe and Dorie! And I love the description of the Nutella coming out in a string and landing on your chin! That is so accurate! But I do love what you did with the recipe! You're brilliant, woman! You did it! When I ate my first Thumbprint tonight filled with blackberry jam, I thought to myself, "I shoulda filled these with Nutella!" But just last week I ate what was left of my jar. Straight out of the jar. With a spoon. Therapy in the form of chocolate hazelnut spread. Anyway, your cookies look delicious! What a great idea. Adding cocoa powder. 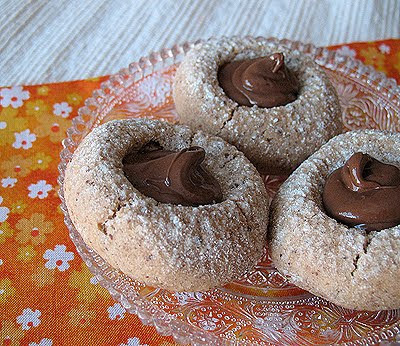 Now I wanna try that the next time I bake these cookies. Sorry yours came out dry. :( I was a little suprised that Dorie's recipe didn't have eggs either. 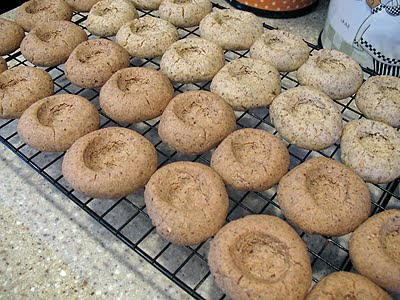 I used almond meal instead of ground hazelnuts and the texture wasn't dry for me.